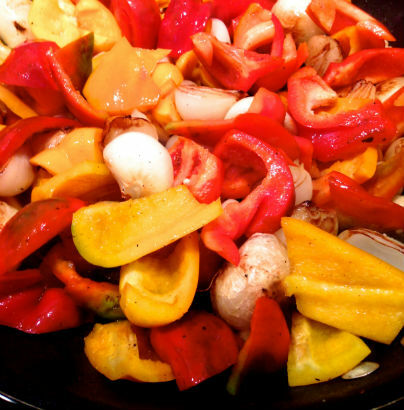 You are at:Home»Recipes»Salads»Seasonal Chef: Cipollini and Peppers? Yes, It’s Really that Simple! 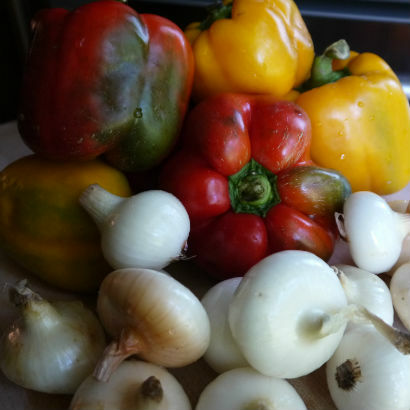 Seasonal Chef: Cipollini and Peppers? Yes, It’s Really that Simple! The cupboard was pretty bare getting back from vacation this weekend, so my first order of business was to head over to the Rye Farmers Market. After a quick spin around to the tables I ended up at Newgate Farm. Donald was there, as usual, and we chatted a little about things they harvested and I spotted some nice big cipollini (pronounced chihp-oh-LEE-nee) onions. and tossed them into the bag. 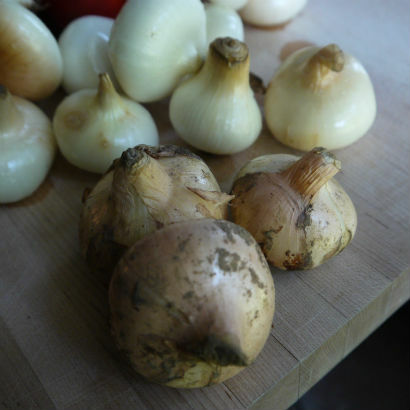 Their name literally means “little onion” in Italian, and that they are. Cipollinis are small, round and slightly flat with a papery light skin. 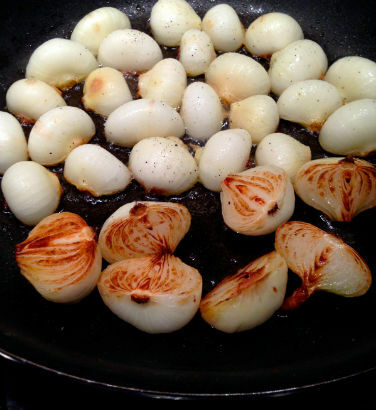 They are sweeter than your average yellow or white onion, which makes them perfect for roasting or caramelizing. Donald gave me a great idea for using them: sautéed with mixed bell peppers and kielbasa, a favorite dish of his. I picked up all the ingredients and decided to give it a try. This is an easy dish to put together and add with a favorite protein. After a quick clean under water I peeled and sliced the cipollinis in half and seared them on the cut side. Just to make things a little interesting I chopped the bell peppers in odd shapes and added them with a little garlic. This dish came together in under 30 minutes. You can easily cook up some kielbasa, as Donald suggested, or even fish or poultry. 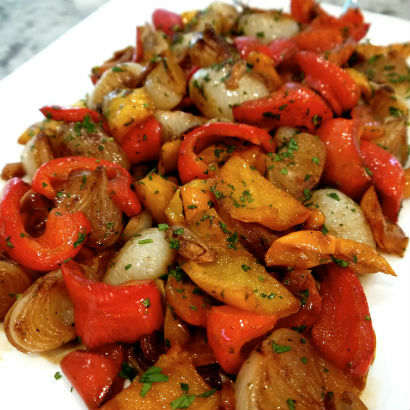 Click this link for the Cipollini and Bell Pepper Mix. Keep and eye out at the farmers market for cipollinis and of course peppers. They are in season and abundant. If you would like to taste this dish I will be heading to the John Jay Farm Market on Saturday and using both ingredients from the Do Re Me Farms. On Sunday I will be at the Down To Earth Rye Market using the Newgate Farm ingredients. Hope to you this weekend!